It seems that every few weeks, or even days, someone reinvents the marketing and sales process with a better and more effective way to capture the attention of prospective customers. Today is yet another one of those days. Introducing VidEngage — the way to keep your visitors focused and engaged in your video marketing message as they browse your website. You’ve probably done this. You visit a website where a product or service is being described in a video presentation. But below the video are further details, so you scroll down the page as the video scrolls out of sight. Some marketers actually stop their video when this happens, to encourage people to pay attention to the video they spent so much time, effort, and money to create for your viewing pleasure. That approach seems counterproductive. But if they let the video continue, the visitor only hears the audio portion of your presentation. They may be missing the most convincing parts of your video marketing presentation. There must be a better way to keep your visitors engaged in your video marketing message. That’s exactly what Brad Stephens and Ankur Shukla thought. So these inventive marketers created the perfect solution. They call it VidEngage. Video marketing audience engagement with VidEngage is sheer genius! The way VidEngage enhances your video sales page is sheer genius. They grab that video and display a smaller version that stays in view as visitors scroll through the sales page. How cool is that! Brilliant, yet simple. Check it out on the sales page, to see this thing in action. 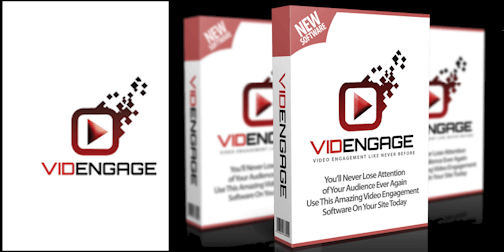 VidEngage is a web-based software that allows your video marketing presentations to VISIBLY continue playing when a user scrolls down a page. It is natural for people to start watching a sales video and while listening, to explore what else may be on the page. Having additional supportive material is important in your overall presentation, for sure, but you want your sales prospect to see your whole presentation. When they scroll through your page, the audio continues playing but the potential customer cannot actually see the video. Consequently, your visitor may miss some of your most important video elements. VidEngage solves this problem by allowing you to clip your video from any source such as YouTube, Vimeo, Amazon s3, or whereever, to the corner on your page as a viewer scrolls down the page. So while they are scrolling they are still able to see the video – ultimately helping you generate more leads and sales. When you think about it, this allows you to use a double-barreled shotgun approach to your marketing effort. Get ’em with both barrels! It stands to reason that your presentation now has a better chance of delivering your entire message, leading to more sales. It is more than theoretical. They’ve even been able to measure the effectiveness of this approach, with outstanding results. While testing the concept, Brad found that visitors stayed 65% longer on pages where VidEngage was deployed. That’s great, right? They also found that over twice as many visitors actually watched the entire video. That’s awesome! But it gets better. Pages with VidEngage produced over 3 times as many opt-ins. They saw an improvement of 350% over other squeeze pages not using this technology. That’s super! But wait, there’s even better news. “Nothing happens until someone makes a sale,” right? I think it was Henry Ford who said that. Well this technology produced six times as many sales! A 600% improvement on actual sales. Can you afford NOT to put this thing to work for you? Even if it only made a slight improvement in your bottom line, this is a tool that will pay for itself perhaps thousands of times over. Once you’ve created your sales page and your video, deploying VidEngage is a simple 5-step process. Select a corner where you’ll want your miniature video to appear, either of the 4 corners of the screen. Add your call to action button, which will appear along side your video. Once you’ve hit your prospects’ hot button, and they are ready to buy, your buy-button will be right there for them. Specify the size of your main and your mini-videos, and whether the video is to autoplay on load. VidEngage then creates an embed code you’ll enter on your web page where you want your video to appear. That’s it. Send people to your website and watch the conversions roll in. Check out the VidEngage presentation yourself to see this thing in action. We are also demonstrating this product on our review of Simple Video Pro, a powerful video player. Check that out too!